Is too much SEO fatal to your website? Too much of a good thing is bad, and this applies as well to SEO. 00:07 – Are you too dependent on SEO? Over dependence on SEO is dangerous [Click To Tweet]. SEO is just like a garnish or seasoning to a meal [Click To Tweet]. Sprinkle a little bit of SEO to what you have [Click To Tweet]. Your website should rely on multiple traffic sources [Click To Tweet]. James Schramko here with an SEO news update and this one’s going to save you some pain. Here’s the thing, the longer you’ve been doing SEO and the more buyers you have towards SEO than all other marketing channels, the more at risk you are with the Penguin filters. You see, they’ve put in a maximum percentage of any acceptable use of anchor text to a particular page by the look of algorithm. So that means, if you haven’t been doing other stuff, it could be a little SEO heavy. We suggest people take a delicate approach to this. You should treat it like a garnish in a meal. You don’t want to overdo it and certainly the meal couldn’t be just the garnish. You want to add it, season it, make the meal better. Make the flavor come out of it by adding some SEO to what you’ve got. SEO is not a single solution for traffic. You need to be doing other stuff. 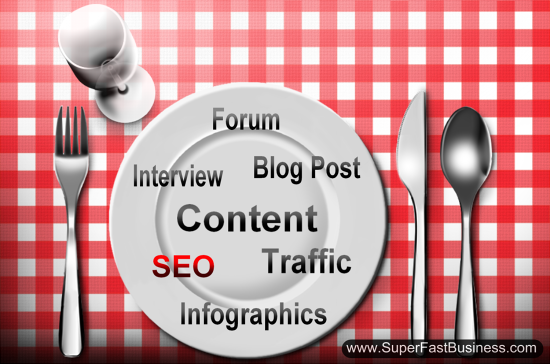 You really need to be focusing on on-page content and we certainly provide that at SuperFastBusiness Traffic Services. But you also want to be doing stuff on your own. You want to be doing interviews, you want blog posts, you want paid traffic, you want great infographics on your site. You want to be part of forums. You really need a website that’s useful. It’s just not acceptable anymore to go out and order a large package and expect that a whole bunch of links is going to do all the heavy lifting for you. You’ve got to balance it out. You have to have a fair and reasonable profile. Otherwise, you look like you’re manipulating the algorithm. If you only have all these links coming to just one page and it’s your favorite keyword and that’s all you’ve got, then you’re going to get penalized eventually. So it’s literally a case of mixing it up. Our team do a really good job of telling where you’re at with your link profile. We watch the websites that we work on very carefully. We make sure that we alert you, that you should be using new target phrases and new target landing pages on a frequent rotation. So here’s what I recommend you do: if you’re not sure, go along to SuperFastBusiness Traffic Services. Fill out the website check. Invest $20 and our team will go and look at your site and manually use the tools that we have available to us, look over your site, check the profile and report to you our findings. If we do recommend a service, it’s only going to be the lowest package we have because we think that’s the best way to start. Too much SEO can kill your website. More is not good. Just like the garnish on the meal, you want to sprinkle a little bit of SEO to everything else you do and you’ll get great results. I hope you’ve enjoyed this update. If you’ve got any questions, pop them right near this video. I’m James Schramko. Yes, I’ve seen businesses investing tons into SEO and even done in a white hat manner in every way, if you go up the rankings too fast Google can get suspicious and then it’s tough going. Nice screen saver, btw. Juho agree. Brute force is often a bad idea.